I have downloaded the Windows 10 ADK and have both the older 8.1 kit and the new one installed. Will the PE builder use the new ADK 10? Has anyone got this to work? I've had no issues with ATI 2015 and the 8.1 ADK, but I've read about issues with the new version so I just wanted to check before I dive in. If it works I can uninstall the 8.1 ADK. In my tests it used the Win 10 ADK. I made the non-PE ISO boot media, but when making the PE version I got an error. There was a display of mounting and updating the WIM file, then 'Failed to create bootable media'. There was a link to click for the KB but that also got an error. No errors were listed in the Event Viewer for System or Application events. The same, or similar, thing happened when I tried it on my laptop. No errors logged in Event Viewer. File System Filter 'WIMMount' (10.0, ‎2015‎-‎07‎-‎09T20:13:18.000000000Z) has successfully loaded and registered with Filter Manager. Where did you download the Win 10 ADK? I used the link at the bottom of this page https://msdn.microsoft.com/en-us/library/windows/hardware/dn914754%28v=vs.85%29.aspx?f=255&MSPPError=-2147217396 . I am having the exact same problem. Any further information about this? I don't want to create a backup and find I cannot restore it to my win10 PC. Well you can make the standard restore disk, just cannot make the Win PE environment one. Yes, that was the place. The installer shows the same version for the kit. I installed two options, the Deployment tools and the PE environment. For my Desktop and Laptop, both show 3.41 GB for the install size. It was pretty much the same process for the Windows 8 and 8.1 ADKs. But prior to that it was different. Yes, I made a standard boot rescue disk and put it on a bootable flash drive. I booted into it and tested it by validating my previous image. I'll do some more thorough tests and a recovery when the dust settles. But it's nice to have a PE version. I have no idea why it doesn't work for you. 1. With only the Windows 8.1 ADK installed. 2. With only the Windows 10 ADK installed. 3. With both the Windows 8.1 and Windows 10 ADK's installed. All three tests worked. In test 3. above when both ADK's were installed, Acronis used the Windows 10 ADK. Maybe you should try uninstalling the Windows 10 ADK and installing the Windows 8.1 ADK. The only thing I can suggest is to uninstall the Media Add-On and then uninstall TI 2016. Then install both again. Perhaps installing one or the other as an upgrade without unistalling first had some bad effect on the WinPE Media Builder. I have both 8.1 and 10 ADK installed. I was planning to uninstall the 8.1 ADK - it's pretty big. If this doesn't get resolved soon I might just live with the Linux boot rescue media. I just spent about an hour or two looking over the PROCMON trace of the MediaBuilder run. It looked to me like it was building the WIM quite nicely and then just gave up for some reason near the very end. The last few things were writing to a log file and looking for a kb_link library. The last was probably to set up the error condition in the knowledge base in the form of a URL. Hopefully that makes sense to someone. 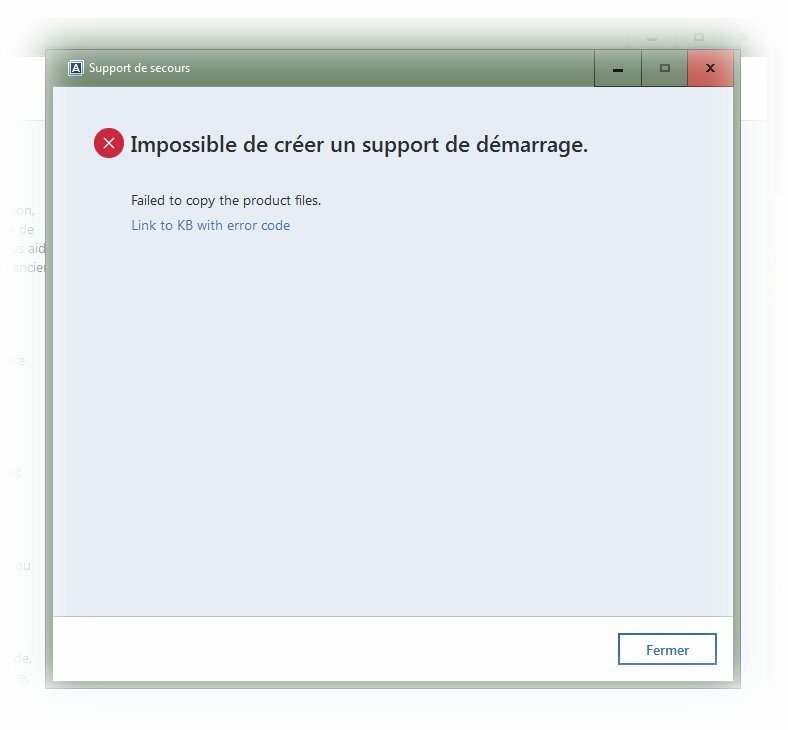 The error message in the file is basically: "Error 0x180023: Failed to copy the product files." The area in Procmon's trace where product files were copied to the WIM did not yield enlightenment. At least I didn't spot any error reading or writing a product file. As a followup to my last post, I should also mention that I have Acronis Disk Director 12 Suite version 3223. I saw that the MediaBuilder was making references to that product - maybe that is the product file it could not load. I have made a Rescue Disk for DD12 (quite a while ago) and it boots and runs fine - I tried it today. Prior to ATI 2015 it was possible to make both (ATI + DD) in one ISO, but that stopped happening at some point in the ATI2015 development. This is sheer speculation on my part. I just ran Disk Director 12's Media builder and it uses the Win 8.1 ADK. It built the ISO successfully. Perhaps ATI 2016 is trying to add on the DD12 product but that is not compatible with the Win 10 ADK? Again, sheer speculation on my part. You may be correct about the problem being DD12. I don't have it installed on my system. Question? Did you install TI 2016 to the default location? The product files for TI 2016 WinPE should be found at C:\Program Files (x86)\Acronis\TrueImageHome\BartPE\WinPE.zip on a 64 bit system. If WinPE.zip is not at that location, you would get an error. WinPE.zip is in the correct location that you describe. I do have DD12 installed but haven't even used it in months. Yes, I'm aware that Acronis bundles together the 32-bit and 64-bit components. The WinPE stuff is there, this is a standard installation with no alterations. There's lots of stuff in the Common Files, too. There is a registry setting in the Mediabuilder that refers to Disk Director and has some configuration paths to the splash screen and startup logic. The attached image shows the details. These seem to be properly installed. I would try uninstalling DD12, but I fear I might need to run the cleanup tool and screw up ATI 2016. I don't think the cleanup tool is ready for Windows 10 yet. Perhaps renaming some of the DD12 registry keys might fool the MediaBuilder, but I've spent too much time on this already. I hope the devs are looking over these forums. please send us your system reports through in-product feedback form. We'll need info from particular systems for investigation, because as for now it hasn't been reproduced in our lab. Thank you in advance for cooperation! Mustang, thank you for your help! OK, I sent two - one for the desktop and one for the laptop and referred back to this forum URL. Well, I actually finally got this to work, but not sure what change I made did the trick. I realized I did not have the newest version of Disk Director, so I uninstalled the old one and installed the new one. I tried to burn a PE boot disk, but it insisted that I have the Win 8.1 ADK, would not use the Win 10 one. Interestingly, although it refused to burn the disk without the ADK installed, it was giving me options to burn a disk with both Disk Director and True Image. I installed the 8.1 ADK and now it burned the disk but gave me no options to include True Image. And now when I ran True Image it gave me an error message regarding the scheduler service. I uninstalled Disk Director, but the error message persisted. 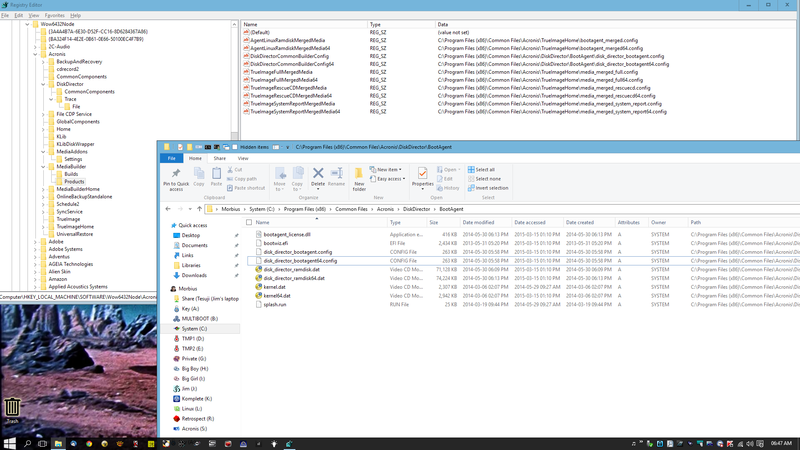 So I uninstalled the media addon and then True Image 2016, then rebooted and deleted the True Image folder, then reinstalled True Image and then the media addon. And now lo and behold, I can burn a PE boot disk. I think maybe there is just some issue with Disk Director, which hasn't been updated in forever and I prefer the Paragon product anyway, so I am leaving it off my computer. joelbb - I have encountered stuff like this with just about every release of Acronis products in the last decade. It works well and wonderfully when it does and it is well worth the effort to install and make work. But if you look through my forum postings throughout the years you will get a tiny glimpse into the problems I have run into. Acronis hooks itself deeply into the OS and is very sensitive to the hardware and software environment. I suppose those that have a clean install or an OEM computer have little trouble, but those of us that build and customize our system have a bit of a problem when things don't work. By the way, I personally don't use any feature of Acronis except for full disk and partition backups. No incrementals, nothing scheduled or non-stop, no cloud. I run a backup when I have made significant changes to my system and find that everything is stable. I have 14 logical volumes and 8 physical drives and a substantial amount of time and effort to make a system that I use effectively. I would be very happy with a streamlined, slim, single purpose application. Reflect is still using the Windows 8.1 ADK on Windows 10 systems. Arachnaut, joelbb, thank you for sent reports! They are being investigated now. arachnaut, I see that you have already collected a ProcMon trace during issue reproduction. May I ask you to share this log with us for investigation? I have sent instructions on how to upload it via a personal message. I re-generated the tracefile and uploaded it. It is compressed with RAR. Ignore the bit about download the microsoft Winpe files. donwload ADK 10 or WDK 10? Thanks for the link Mustang! Have you already elaborated if it is it still so complicated to put DD12 and ATIH 2016 into one Windows PE (UEFI)? I have just noticed an anomaly, if I use the Media Builder from TI 2016 then the W10 ADK is not recognised and the Builder only offers to download W7 -> W8.1 ADKs, however, if I use the Universal Restore Builder, it automatically finds the W10 ADK and works correctly. Just a heads up, don't try and add too many drivers to the UR, it freezes after reaching 50%. How many is too many drivers I hear you ask, hmm, when you try to add your complete Windows driver folder to the media. Obviously not how it is meant to be used, but interesting that there would seem to be a limit. Hmm, might this limit referenced by Colin be available space on the media being used has been reached? I get the same error message if I try to create a WinPE to a USB drive that has an earlier version of WinPE on it. If I delete the FAT32 partition and create a new FAT32 partition on the USB drive, it works with no error. The changelog on the Hotfix version 5576 does not mention anything about the WinPE problem. While the update for True Image and the corresponding add-ons went well, the problem remains unchanged. The Linux-based boot ISO was made OK and works fine. Version 5586 is out today, but still this issue exists. windows 10 stop acronis 2016 addons dangerous files !!!! since Windows 8, Windows will warn users about files that haven't been downloaded many times (Smarscreen filter) and so flagged as potential insecure. In this warning dialogue choose > more information (left bottom) and proceed with your download.